Archduke Charles' Legion fought in numerous campaigns and constituted a significant force. It's therefore surprising that the details of its dress are not more commonly available. None of the more popular books, including those excellent Napoleonic uniform booklets from W.R. Rawkins of England, reference them. To their credit, Bowden and Tarbox (Armies of the 1809 Campaign) describe a uniform in their footnotes but seem to inaccurately attribute it to the whole Legion. This Legion should not be confused with the other "Legion Erzherzog Karl" established in 1792 and converted to light infantry in 1797. The Bohmische-mahrische Legion Erzherzog Karl, discussed here, was formed in 1800 at twenty-two battalions and a Jaeger corps. The first battalion was formed from students at the Karl Ferdinand University of Prague and entitled the Leib Battalion. Each battalion had a "Shutzen" company armed (like the Jaegers) with short rifles. The troops wore a typically Austrian coatee and breeches. The boots reached to just below the knees. The coatee had small round cuffs, except for that of the Leib Battalion which had small pointed cuffs with one strip of vertical button lace. Distinctive of this Legion, the coatees were laced on the breast with eight rows of lace reaching across the whole front of the coatee. The sword belt, scabbards, ammunition box, ammunition box belt and boots were all black leather. The belts were worn crossed over the shoulders. A gray overcoat was worn rolled up sitting over the cartridge box. The neck stock was black. The scabbards' fittings and the sword hilt were brass for the men and silver for the officers. Musket slings were black. Sword knots and officers' sashes were yellow. The headgear varied greatly. However, all types had a large yellow "EK" monogram fastened on the front. The woolen "Raupe" on the Kasket was of the facing color. The large plume (sparingly worn) was white, and worn above a pom-pom centered on the top front (except on the Kasket and Corsehut). The pom-pom was white with a red center. The Kasket had white (red center) cockades over the chin strap rivets. All the headgear was black. The kasket had brass edging on the peak and the crest. Other headgear had two white bands around the top of the crown. 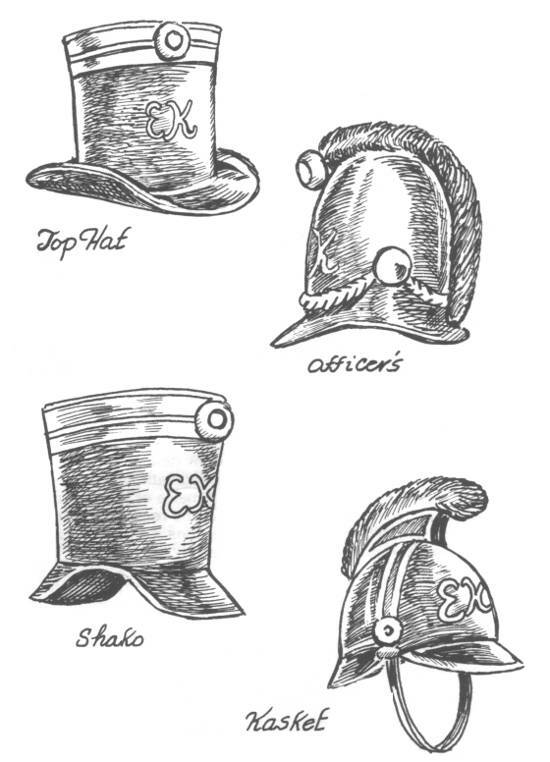 Types of headgear were the "Kasket", "Corsehut" (turned up on left side), double-peaked stovepipe shako and a bell crown top hat (similar to the 1801 Royal Marines). Knoetel shows the "Schutze" of Battalion No. 11 in the Kasket, man of Battalion No. 16 in the "top hat", the Leib Battalion in the shako and its officer in a large "Raupenkasket" (a top hat with rounded crown). My own view is that the popular "Corsehut" was probably worn in the field most of the time, while the Schutzen wore Kaskets, until the shako was forced upon them. The rest of the uniform varied somewhat among the battalions. The Jaegers wore a light gray coatee and breeches. The coatees had grass green collars, cuffs, turnback piping. shoulder strap piping and breast lace. The buttons were yellow metal. The Leib Battalion wore a chocolate brown coatee and light blue breeches. The coatees had sea green collars, cuffs and turnback piping. The breast lace was silver. The buttons were white metal. Red and silver worsted epaulettes were worn on both shoulders. I'd paint the silver lace white however. Battalion No. 16 wore a dark blue coatee and breeches. The coatees had scarlet collars, cuffs, turnback piping, shoulder strap piping and breast lace. Buttons were yellow metal. The remainder of the battalions (Nos. 2 through 15, and 17 through 22) wore fawn color coatees. Light blue breeches were worn except for Battalions Nos. 9, 11 and 12 which wore fawn breeches. The breast lace, collars, cuffs, turnback piping and shoulder strap piping were all the facing color of the particular battalion. Note that the grass green appears in the Knoetel plate to be more of an olive shade. Sea green is a more of a medium green than a blue-green. Knotel, Richard. Mittheilungen zur Geschichte der militarischen Tract. Rathenow, issue No. 4, 1906. Reprinted by W. Spemann, Stuttgart, 1980. Knotel, Richard. Gross Uniformenkunde (lose Blatter) Rathenow, 1924. Knotel, Richard and Sieg, Herbert. Handbuch der Uniformkunde. Hamburg, 1937. Reprinted Nachdruck, 1969. Bowden, Scotty and Tarbox, Charlie. Armies on the Danube 1809. Empire Games, Arlington, TX 1980. Brauer, Hans M. "Herr and Tradition." Plate no. 84.